Sonoma’s Dry Creek Valley was settled by American families following the Gold Rush of 1849. By the 1880s, the area we now recognize as an AVA was home to nine wineries and almost 900 acres of vines were planted. A few of our present-day wineries have been making wine since the 19th century, and many of our current wineries make zinfandel from grapes planted more than 100 years ago. 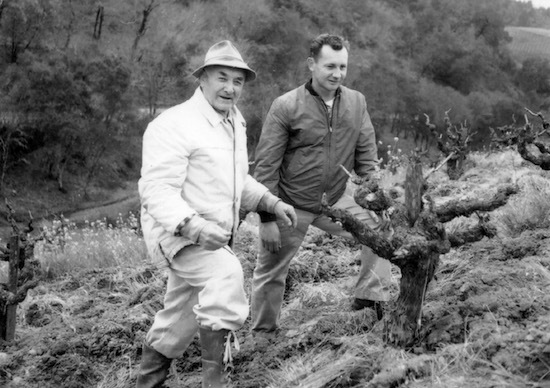 Here’s a photo essay looking back at the early days of a few of our pioneering winegrowers: Mauritson Wines, Seghesio Family Vineyards, Puccioni Vineyards, and Pedroncelli. The Mauritson family, farming in Dry Creek Valley since 1868. The Mauritson family property in what is now Rockpile AVA, at the turn of the 20th century. Edoardo and Angela, founders of Seghesio Family Vineyards stand in front of the Sonoma County home they purchased in 1895. Louie Puccioni of Pucccioni Vineyards, b. 1906, in tending his family’s vineyard. Louie Puccioni tends to the crops with his mules. Pedroncelli family barbecue in the late 1940s.